EEek! 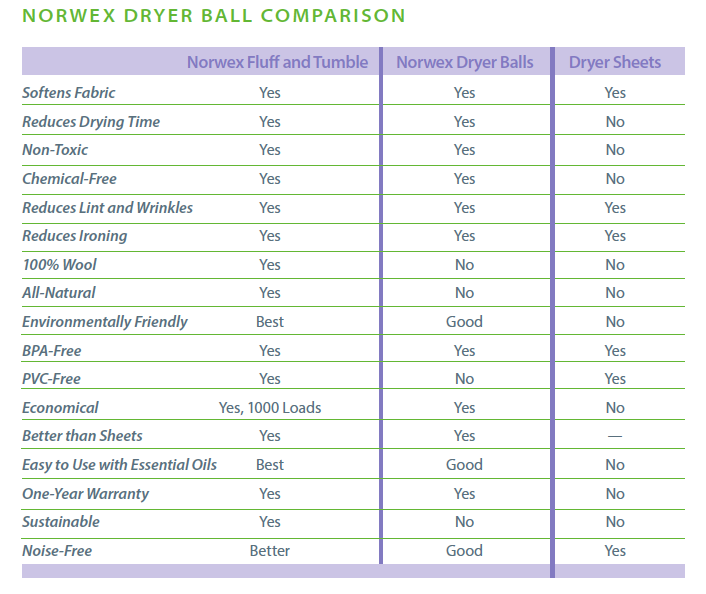 I'm SO incredibly excited about the new Fluff and Tumble Dryer Balls from Norwex. They come in a set of three, and are AMAZING at reducing drying time, wrinkles, and static - all without chemicals or harmful ingredients! They are made of 100% wool - a sustainable resource and naturally biodegradable - and are hand-spun tightly. They will last up to three years, or 1000 loads, in your dryer. Although they make your clothes feel soft and smell “fresh,” fabric softeners and dryer sheets are some of the most toxic products around. They add toxic chemicals to your laundry and, consequently, your body. Plus, it can take YEARS for a dryer sheet to break down in landfills. According to Scientific American, some of the most harmful ingredients in dryer sheets and liquid fabric softeners alike include benzyl acetate (linked to pancreatic cancer), benzyl alcohol (an upper respiratory tract irritant), ethanol (linked to central nervous system disorders) and chloroform (a neurotoxin and carcinogen), among others. Since fabric softeners are designed to stay in your clothes for extended periods of time, such chemicals can seep out gradually and be inhaled or absorbed directly through the skin. “Greener” Laundry by the Load: Fabric Softener versus Dryer Sheets, Scientific American, December 10, 2008. http://www.scientificamerican.com. 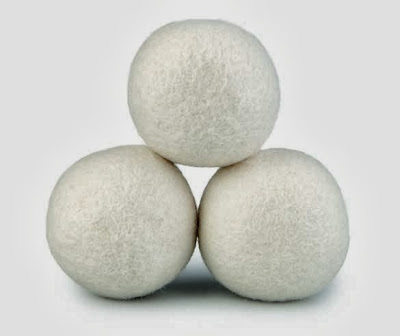 Fluff and Tumble Dryer Balls are a natural fabric softener you use in your dryer. They bounce around to naturally separate and create space between your laundry, allowing the hot dryer air to circulate better and soften fabrics. Made of 100% wool, they help reduce drying time, static cling and wrinkles, all naturally, without chemicals. Use them instead of fabric softener or dryer sheets and radically reduce chemicals in your home - chemicals that are not only harmful to the environment, but are harmful to people as well. • Replaces the need for dryer sheets and fabric softener! • Can be left in the dryer; they won’t melt. • Simply toss the dryer balls in your dryer and start. No need to remove them from the dryer, just reuse! 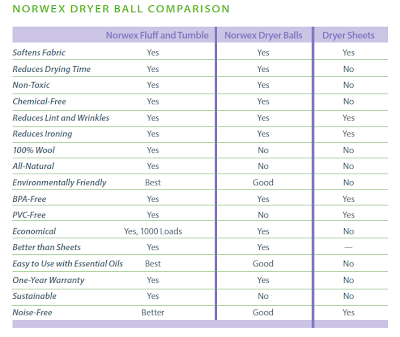 • Try them with a drop or two of pure essential oil for heavenly scented laundry. 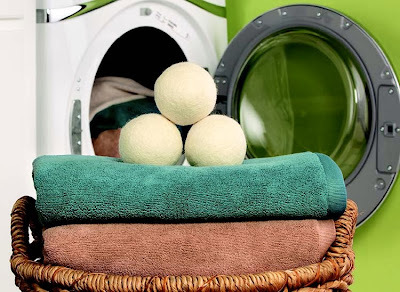 After the laundry is completely dried, take out 2 of the Fluff and Tumble Dryer Balls and apply desired amount of pure essential oil to each ball. Toss the 2 back into the dryer with the other one and run on Air Fluff (no heat), so the delicate oil is not damaged, for 10 minutes. Your laundry will smell heavenly, and the scent will linger for several days! Requested by a customer, here are the directions and care from the Fluff & Tumble Dryer Balls box.